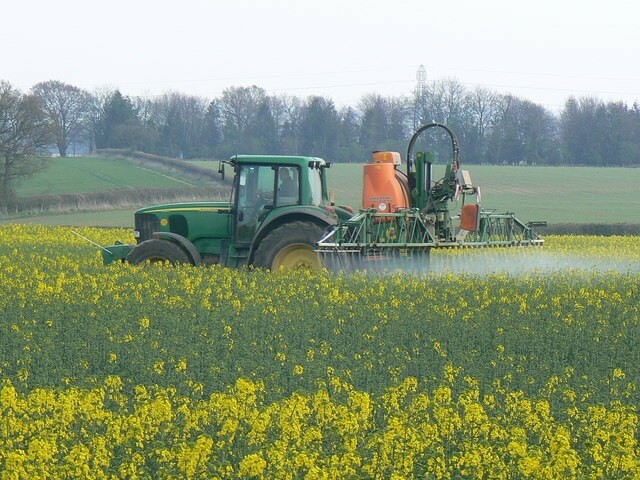 Environmental groups that are opposed to the use of innovative crop technologies such as genetically modified (GM) crops that are herbicide tolerant (HT), frequently like to proclaim that the use of these crops has resulted in a substantial increase in chemical use. The simple answer to this is, yes, chemical use has increased. 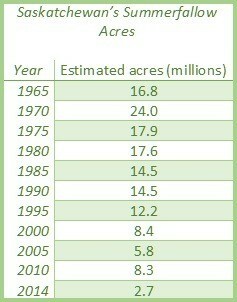 However, while chemical use has increased, farming is far more sustainable today than was previously the case. Here’s why. Source: Statistics Canada. Table 001-0017 – Estimated areas, yield, production, average farm price and total farm value of principal field crops, in imperial units, annual, CANSIM (database). Prior to the innovation of HT crops, farmers relied on cultivation to control weeds. On average, a field would be taken out of crop production one out of every three years and be regularly cultivated to control weeds. 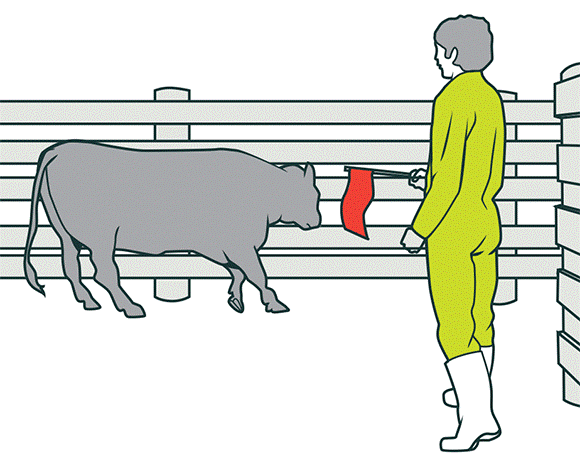 This practice is known as summerfallow. 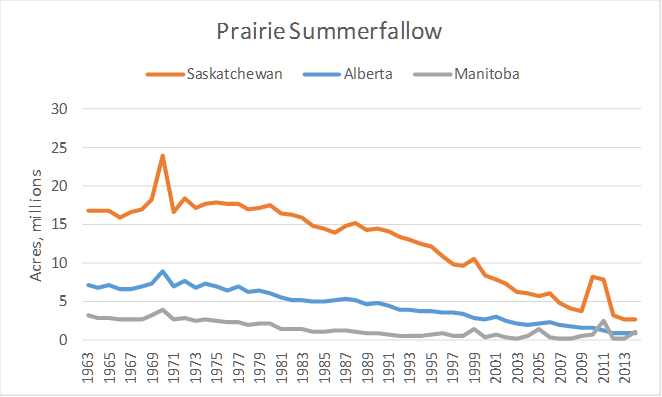 Summerfallow acres peaked around 1970 at 37 million acres over the three Prairie provinces. 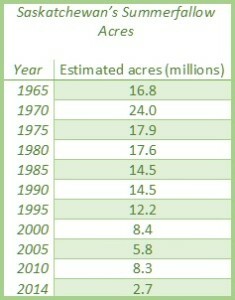 Throughout the 1970s and 1980s, summerfallow acres continually declined due in part to better farm equipment that allowed farmers to use zero-tillage practices and to a dryer climate. HT canola was first grown in 1995, when there were 17 million acres of summerfallow. The environmental impact of summerfallow is substantial as the conventional norm for effective weed control was to cultivate a summerfallow field 10 times during the growing season, which works out to about once every 2 weeks. Source: Table 001-0071 Estimated areas, yield and production of principal field crops by Small Area Data Regions, in imperial units, annual, CANSIM (database). The use of HT canola has provided farmers with a new option for weed control that they previously didn’t have. This has resulted in a decline in summerfallow acres of 78% between 1995 and 2014. The majority of this land that used to be summerfallow is now being used to grow food crops that require the application of chemicals to control weeds. With 9.5 million acres of cropland not being in summerfallow, but being used to produce food, more chemicals are applied to farmland today than has previously been the case. The most recent summerfallow data, following 20 years of HT canola production shows a decline to 2.7 million acres. 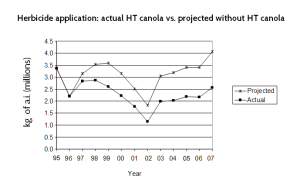 A farm survey I led in 2006, 10 years after the first use of HT canola, found that 86% of farmers that grew HT canola reported reduced soil erosion, while 83% reported increase moisture conservation. The new option for weed control has resulted in more environmentally sustainable means of farming due to the use of HT crops like canola, corn, and soybeans. three-quarters of the acres that used to be summerfallowed every year for weed control are now used to produce food crops in an environmentally beneficial way. The farm survey we did found that HT canola has actually led to a decline in chemical applications in spite of being grown on more acres. The figure below shows how much chemical use would have been required to produce canola assuming HT canola had not been developed, compared to how much was actually applied. This is a decline of 40%. When you look at a 2% organic matter content can hold 40 lbs of water and a 4% organic matter can hold 140 lbs of water based on a four inch by 24 inch column sample. It’s easy to see why summer fallow is a thing of the past. This is not without some very serious problems. Cropping land in this manner is causing many other issues. One of the main ones at this point is chemical resistance weeds as well as other more serious problems. A great example of this is club root. Due to these new practice club root cases have taken off and is serious threat to canola in the prairies. As it stands right now there is no real effective way of dealing with this problem, caused in large part to continues cropping, increased chemical usage and the introduction of ht canolas. There are club root resistance varieties that help lessen the damage caused, but they do not halt the reproduction of the club root spores as only a certain percentage of canola that is seeded has any resistance to club root. Due to this fact once a field has been infected there is little to no way to get rid of the infestation. In time if there is not a highly effective way to deal with this there will be large parts of the prairies that are too infected to even grow canola. To say this new method is environmental friendly in my opinion is a a pretty big stretch. At best it is just shifting to a new possibly much more devastating problem and to be completely fair making the pharmaceutical corporations that make them rich. Clubroot and the development of herbicide resistance in weeds are two unrelated issues. Herbicide resistance in weeds is a serious issue and is becoming problematic in US cotton production. 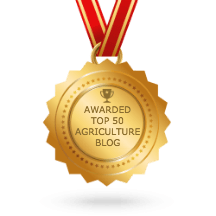 Western Canada has the advantage of a more diverse crop rotation than is practiced in the US. This is not to say that farmers should ignore the potential for increased herbicide resistance in weeds, but crop rotations in Western Canada are conducive to mitigating this problem. Chemical companies and the industry as a whole do a good job of communication and outreach about the importance of not relying heavily on only one chemical for weed control. A good example of this is how the wheat industry is doing an excellent job of communicating about correct stewardship practices regarding the use of midge tolerant wheat and that there is no ‘Plan B’ for controlling wheat midge. Clubroot on the other hand is a soil pathogen. While there is not a great deal currently known about where clubroot originated, there appears to be no studies suggesting there is a link between clubroot and HT canola. Developing new canola varieties that are resistant to clubroot will contribute a great deal to ensuring that farmers can profitably produce canola in all areas of Western Canada. Environmental sustainability is not simple or well understood. Cause and effects have considerable lags, making correlations difficult. I believe that increasing moisture conservation and reducing soil erosion are two exceptional sustainability benefits that result from HT canola. Without this option for weed control, farmers will be forced to rely on tillage for weed control, which is not a sustainable means of crop production. Does continuous cropping raise other challenges. Yes, it most certainly will. When these new challenges are compared to the loss of millions of tons of top soil in the early 1980s, I believe that HT crops are a move in the correct direction for agricultural sustainability. Organic farmers have sharply curtailed traditional summer fallow as well, switching to longer rotations and green manure slowdowns/partial fallow.